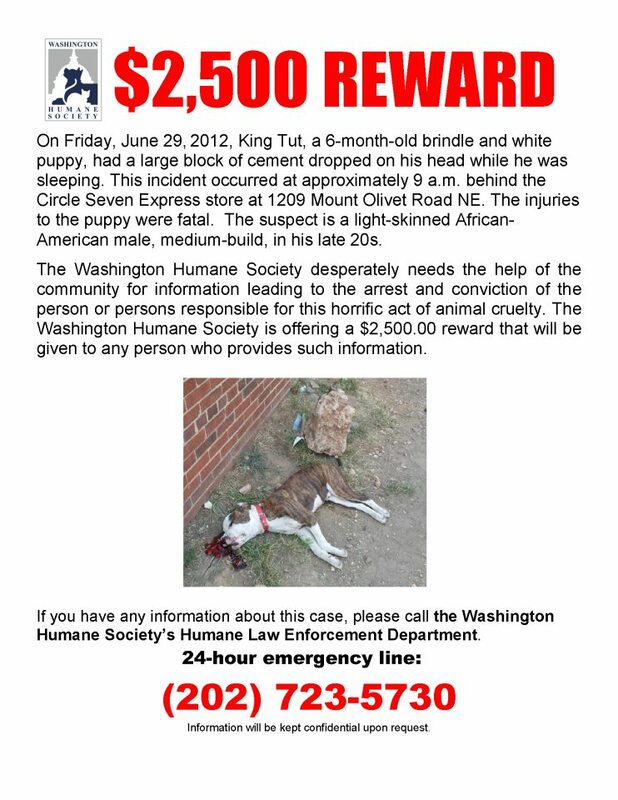 On Friday June 29th 2012, King Tut, a 6-month old brindle and white puppy, had a large block of cement dropped on his head while he was sleeping. This incident occurred at approximately 9 a.m. behind the Circle Seven Express store at 1209 Mount Olivet Road, NE. The injuries to the puppy were fatal. The suspect is a light-skinned African-American male, medium-build, in his late 20s. The Washington Humane Society desperately needs the help of the community for information leading to the arrest and conviction of the person or persons responsible for this horrific act of animal cruelty. The Washington Humane Society is offering a $1,000.00 $2,500.00 reward that will be given to any person who provides such information. Please share this information and the reward poster (WARNING: The poster contains a very graphic image of the murdered puppy and is below the page break) with others in community. Information will be kept confidential upon request. Posted on July 2, 2012, in Crime and tagged animal cruelty. Bookmark the permalink. 1 Comment.